Chief Justice John Roberts referred 15 judicial misconduct complaints against Justice Brett Kavanaugh to the 10th U.S. Circuit Court of Appeals for further investigation Wednesday. The referral is likely of little consequence, however, as Kavanaugh’s confirmation to the Supreme Court places him beyond the reach of ordinary judicial rules, making him removable only through impeachment. 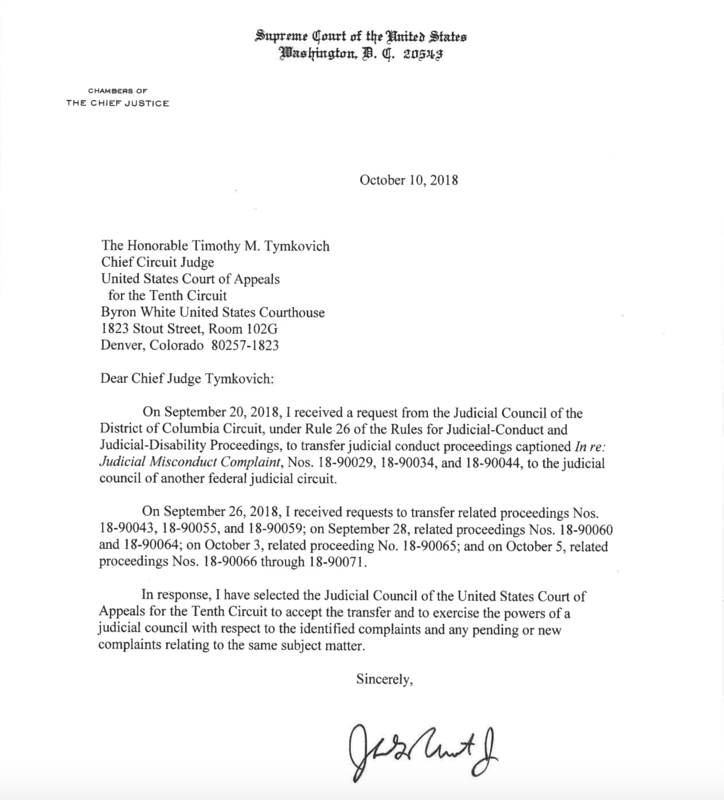 “I’m a little disappointed that Chief Justice Roberts sent the Kavanaugh complaints to the 10th Circuit Judicial Council given that its chief judge, Tim Tymkovich, was picked by the Bush administration during the time Kavanaugh was working on judicial nominations in the White House counsel’s office,” Gabe Roth, executive director of the judicial oversight group Fix the Court, told The Daily Caller News Foundation. Judge Merrick Garland would ordinarily process these complaints in his capacity as chief judge of the D.C. Circuit. Garland recused himself from the matter, however, so Judge Karen LeCraft Henderson disposed of the complaints by referring them to Roberts. The Washington Post first reported on Henderson’s referral. “The complaints seek investigations only of the public statements he has made as a nominee to the Supreme Court of the United States,” Henderson said in a statement. They do not pertain to the sexual misconduct allegations Christine Blasey Ford, Deborah Ramirez and others lodged against Kavanaugh, as judicial conduct inquiries do not reach events which occurred before a judge’s elevation to the federal bench. Judicial conduct and disability inquiries generally remain confidential until they are completed. Now that Kavanaugh is a justice, it’s unlikely he will face consequences, whatever the merit of the complaints. Roth noted the rules governing judicial behavior do not apply to Supreme Court justices. Kavanaugh heard his first arguments as a justice Tuesday.